Mama's Baby Cupcakes, Mommy's Favorite Things and the "A Haunted Halloween" participating bloggers are not responsible for sponsors who do not fulfill prize obligations. The costume gift certificate for sure! I'm most excited about the Buy Costumes Gift Card! I am most excited about the Wall Slicks, and I would pick the spooky trees. I am most excited about the costumes gift certificate! I'm most excited for the $100 Certificate to Buy Costumes! 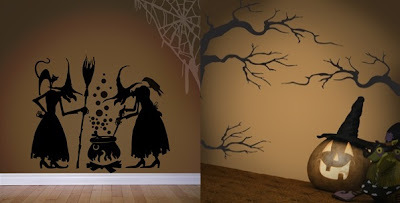 The spooky wall slicks - they'd really decorate the place. Thanks. I am most excited about the wall slicks. We love to decorate and this would be awesome to add to our collection. I am most excited about the Baby Costumes $100 GC! I am most excited about the costumes! What a huge help! I would be most excited to win the $100 gift certificate from Buy Costumes. LOVE the haunted house and bats Wall slicks!! The wall slicks look so very awesome! I'm most excited about the costume! Our older two have theirs already but our 3 year old really wants to be Batman and I don't have it for him yet! I would love the costume gift card for my son to have a costume. I am really excited about the BuyCostumes gift card! Most excited about the $100 Certificate to Buy Costumes. All of it sounds great but I'm most excited about the Buy Costumes GC. I am most excited about the $100 Costume Certificate. The Gift Certificate. I can buy my nephew his costume then. I am most excited about the $100 Costume Certificate. My kids would love it. I'm most excited about the $100 Certificate to Buy Costumes. I'm most excited about the Buy Costumes certificate....very cool. I'm most excited about the costumes gift certificate! Most excited about the Buy Costumes GC. I'm most excited about the costume certificate. I'm most excited about the costume gift certificate! I like the wall decals. I'm excited about the Sour Beans! Im excited for the cute wall slicks!! I am most excited about the buycostumes.com GC! I'm excited about all of them. They are all wonderful prizes. If I had to pick one, I would say the costume gift certificate. I'm excited about the BuyCostume.com GC! I'm excited most about the $100 certificate to Buy Costumes. I'm excited most about the $100 certificate to Buy Costumes! I definitely am very excited about the costume gift certificate. All great prizes...I really like the Wall Slicks Haunted House, Bats and Spooky Trees (Value of $108). I'm most excited about the Buy Costumes GC. I'm most excited about the gift certificate. Costumes are so expensive and this would help me to get one for both my kids! I'm most excited about the gift certificate! Definitely excited about the gift-certificate! Would love to win the costume certificate!!! THank you for hosting this giveaway!!! I love the gift certificate. I'm most excited about the costumes gift card! I'm most excited for the Buy COstumes CG! I am most excited about the Buy Costumes Gift Certificate. The $100 GC from Buy Costumes! I am most excited about the 100 dollars to buy costumes. Costumes can be so expensive! I am most interested in the $100 Certificate to Buy Costumes. 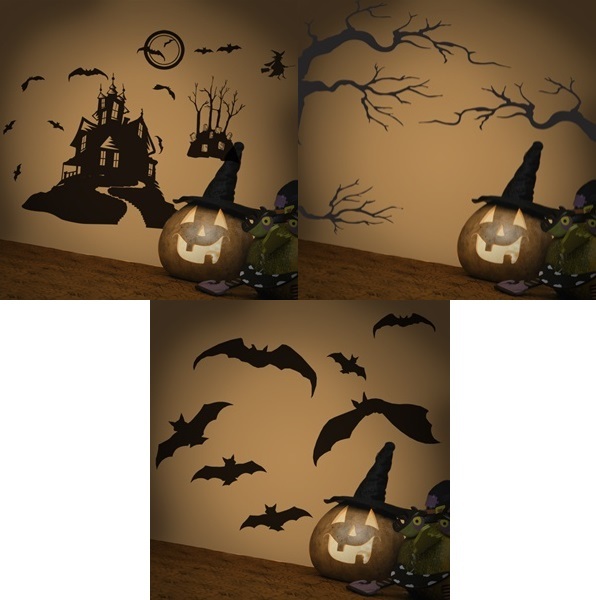 We LOVE Halloween and decorating so the wall stickers are exciting to us! I'm excited about the gift card for costumes. That's a hard one I would love the costume gc but I love the wall clings and who couldn't use the candy to give away. But..I would have to go with the wall clings. I am most excited about the $100 to buy costumes. i'm excited about the gc for costumes! 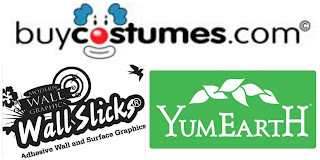 I'm excited about the buycostumes.com gift certificate. it would be neat to get my kids coordinated costumes like princesses and a prince. The Costume GC; it will help us get costumes this year. Thanks! I'd like the costume GC. I don't do much with spooky houses. The costume certificate...I could get my son a great costume with that! I'm excited about the $100 Costume Certificate from Buy Costumes. I'm most excited about the $100 Gift Certificate to Buy Costumes because I would really love to get a great Halloween costume this year. I'm most excited about the gift certificate. All three are great prizes! But I suppose the Buy Costumes giftcard would be most helpful - I've shopped with them before and they have a great selection. I like all of the prizes, but I am most excited about the Costumes gc. I'm most excited about the costumes! I am excited by the Buy Costumes gift card, need a new witches hat for my good days..LOL. The gift card - so I can buy our boys their costumes! Most excited about the costumes for sure! I'm definitely most excited for the Buy Costumes $100 Certificate! I would like the $100 gift certificate so I can choose something for my grandbaby. Bulk Bag of Sour Beans from Yum Earth comes a close second because WOO-HOO for candy! I am most excited about the $100 costume certificate because I have several Halloween parties to attend and I don't want to wear the same costume to each one. I am most excited about the costumes gift certificate!!! !for my costumes to hand out treats!!!!!!!!!!!! Although I do love to decorate and the wall slicks will be awesome, I'm most excited about the costume GC! The gift certificate for costumes!! $100 Certificate to Buy Costumes - oh yeah baby! I'm most excited about the $100 gift certificate, because costumes can be expensive! GIft Certi.. Spooky Trees.. very cool hop.. ;) Love it. I'm most excited about using a costume gift cert. My kiddoes love to dress up! I am excited about the costumes gift certificate. I would purchase my daughter a new costume. I am most excited about the costume gift certificate. I am most excited about the sour beans. I'm most excited about Buy Costumes. The Buy Costumes! I need a costume for my son. I'm excited for the Buy Costumes GC!! I am most excited about the wall decorations! They are so cute! The wall decorations! They're something that might stay up year round in my household! Most excited about the gift card for a costume! I am most excited about the Buy Costume prize. I love decorating for Halloween. I am loving the Spooky Tree from wall slicks! I'm most excited for the wall decals. costumes are the most exciting! I really want the JellyBeans! The GC to buy costumes. I've always wanted a really cool costume and that would definitely give me the opportunity to enjoy something really awesome! The costume gift certificate! Thanks for the chance to win! I'm most excited about the costume gift certificate~! I love it all, but with 3 boys, the gc has to be my favorite! Thanks! 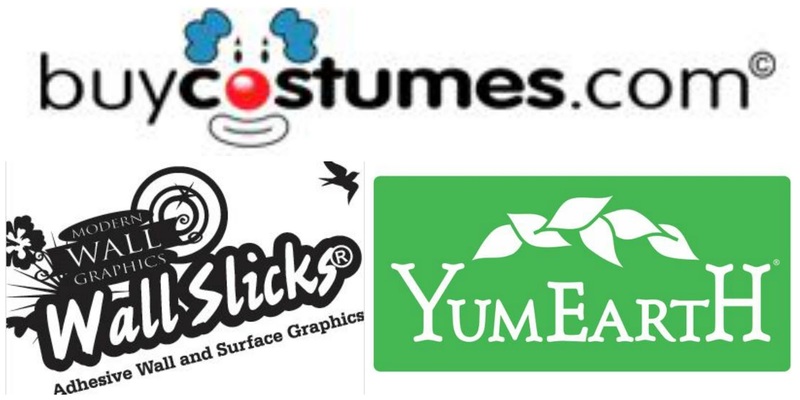 Most excited about the YumEarth and buycostumes.com! I'm excited for the buycostumes gift card! I really like the gift certificate.